7 For All Mankind provides denim based fashions for the entire family. Expect to receive deals of at least 40% off sitewide, including all men's and women's designer jeans and outfits, on Black Friday. The 2019 7 For All Mankind Black Friday deals have not yet been released. While we don't have the Black Friday ad for 7ForAllMankind.com yet, below are some of their historical deals which will give you a good indication of what you can expect during this year's sale. The 2016 7 For All Mankind Black Friday sale has arrived and they are advertising the softer side of their clothing by giving great deals on styles that look as good as they feel. This year, 7 For All Mankind is having 40% off all products on their website when you use code GIVE40 at checkout. This excludes all clearance sale items which is a bit different than previous years. However, new this year they are offering free shipping on all orders during Black Friday weekend so we suggest that you definitely take advantage of this sale while it's available. 7 For All Mankind is back with another great Black Friday deal. Compared to last year, they've clarified the sale by offering 40% off every purchase when you use code BLACK40 at checkout. Also, in their clearance sale section, you can save another 20% off on all already discounted items including jeans, shirts, blouses, and so much more. 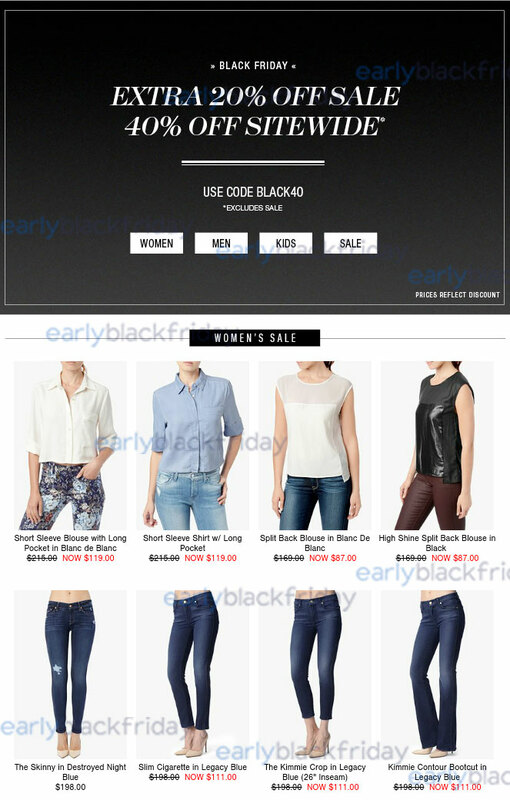 At the moment, the 7ForAllMankind.com website is loading relatively fast so we believe that they are handling the rush of Black Friday traffic well and should be able to easily take orders online during this sale. 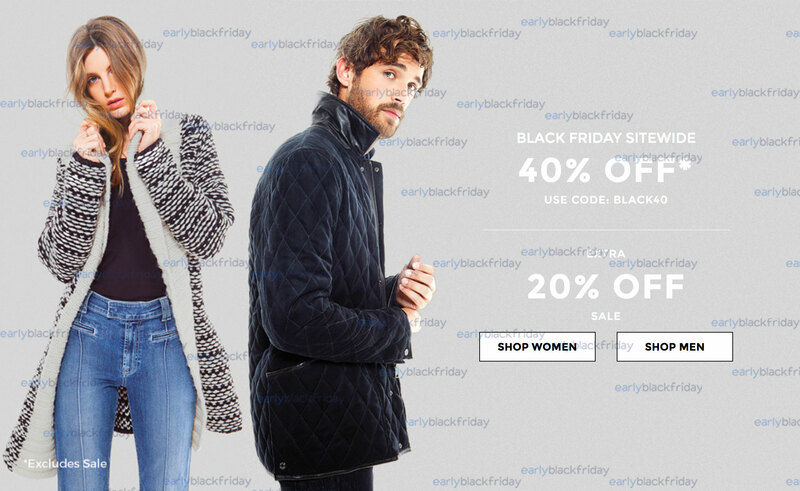 This Black Friday, 7 For All Mankind has 40% off their entire website plus you can save an additional 20% off when you use code BLACK40 at checkout. Some examples of the doorbuster deals they are offering include a short sleeve shirt w/long pocket for $119 (save $94), a split back blouse in blanc de blanc for $87 (save $82), and the Kimmie Contour Bootcut jeans in legacy blue for just $111 (save $87). 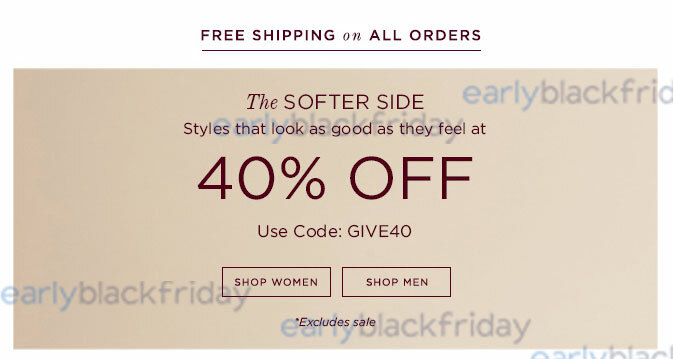 The sale also includes clothing and jeans deals for men and children too so we suggest you hurry 7ForAllMankind.com to take advantage of the savings!